Since 1990, I’ve been working with students from Northwestern and colleagues from other universities to learn more about earthquakes in the central U.S.’s New Madrid seismic zone. Large (magnitude 7) earthquakes occurred here in 1811 and 1812, and small earthquakes continue here today. Our goal is to understand how these earthquakes and similar ones elsewhere within continents work and how to use that information to make sensible earthquake hazard policy. To our surprise, almost 20 years of very precise Global Positioning System (GPS) data across the New Madrid zone don’t show the motion we see at faults as the earth stores up strain for a large earthquake. Hence it looks likely that the major earthquakes that have happened in the past thousand years are ending, although smaller earthquakes continue. Combining the GPS data with geological results leads to a new view of how mid-continent earthquakes like the ones in the central U.S. behave. Unlike plate boundaries like California, where earthquakes repeat more-or-less regularly for millions of years, earthquakes within continents move around between lots of faults that turn on and off. 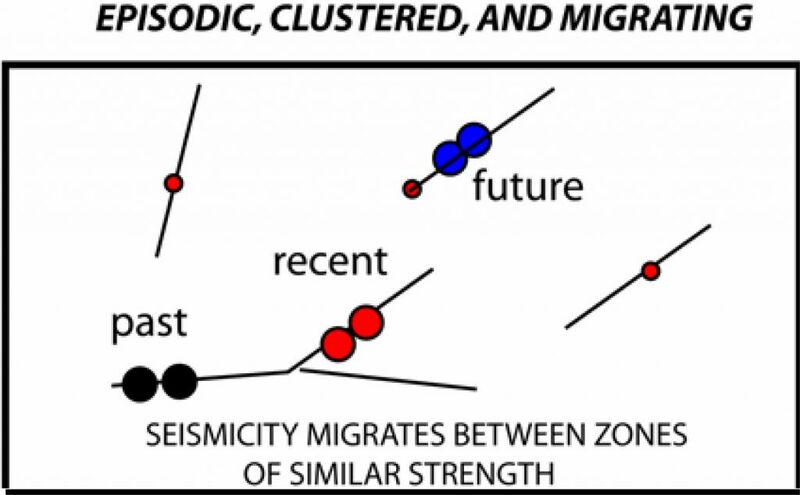 Thus they are “episodic, migrating, and clustered.” Earthquakes occur for a while on a fault system, which then shuts down for some time while other fault systems becomes active. Because of these interactions, faults within continents form what’s called a “complex system.” Complex systems are ones in which the whole system behaves in a way more complicated than can be understood by studying its component parts. For example, the human body is more complicated than we can understand by studying individual cells, the economy is more complicated than can be explained by studying individual business transactions, and studying one ant doesn’t tell us how an ant colony behaves. I’ve been exploring this concept with Mian Liu of the University of Missouri, Eric Calais of Purdue, and Qingsong Li from the Lunar and Planetary Institute. 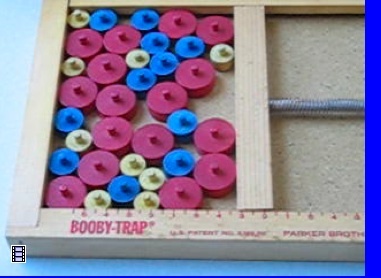 A nice analogy, suggested by Bob Smalley of the University of Memphis, is the game “Booby-Trap”. It’s a box with a spring bar pushing on lots of small pieces. When you remove one piece some of the others slide around in a complicated way, depending on the pattern of the pieces and how much each is being pushed. Some can be removed without making anything happen, but removing others makes many pieces slide. Removing a small piece can have a big effect, and removing a large piece can do nothing. All this makes it hard to tell what will happen before you remove a piece. The game is somewhat like earthquakes within continents, except that we don’t have to watch for thousands of years to see what’s going on. The new data and concepts let us think about earthquake hazards in a more sophisticated way than just saying earthquakes will happen in the future where they happened in the past. 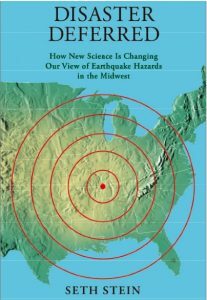 In particular, there’s no sign that a major earthquake is on the way in the central U.S. any time soon, especially because many of the small earthquakes that occur today look like aftershocks of past large earthquakes rather than indicators of future ones. 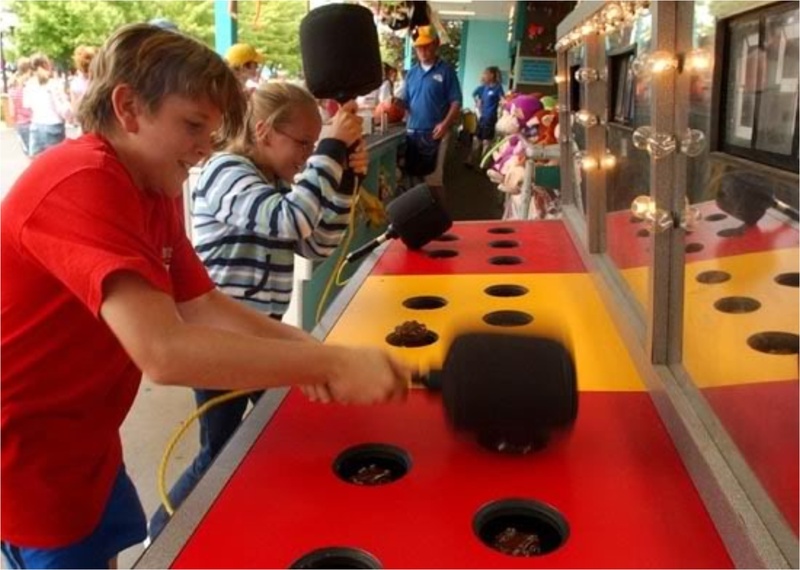 That means that predicting where big earthquakes will happen based on small quakes is like the ‘Whack-a-mole’ game — you wait for the mole to come up where it went down, but it’s likely to pop up somewhere else. So instead of just focusing on where small earthquakes happen, we need to use methods like GPS and computer modeling to look for places where the earth is storing up energy for a large future earthquake. We don’t see that in the Midwest today, but we want to keep looking. 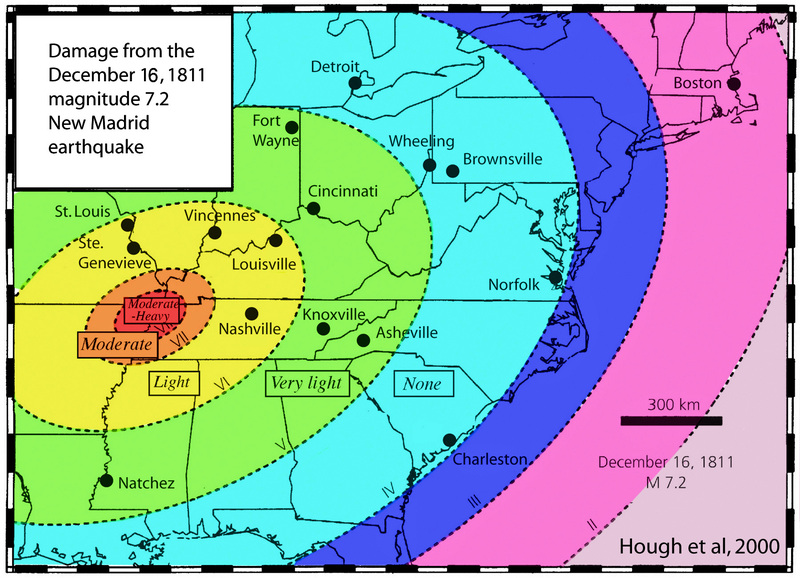 The good news is that the New Madrid earthquakes are an interesting scientific issue but don’t look like a major hazard to communities in the area. These studies are described in a book Disaster Deferred published in 2010 by Columbia University Press. Newman, A., S. Stein, J. Weber, J. Engeln, A. Mao, and T. Dixon, Slow deformation and low seismic hazard at the New Madrid seismic zone, Science, 284, 619-621, 1999. Click here for pdf. Calais, E. and S. Stein, Time-variable deformation in the New Madrid seismic zone, Science, 5920, 1442, 2009. Click here for pdf. Paper discussing the complex fault concept: Stein, S., M. Liu, E. Calais, and Q. Li, Midcontinent earthquakes as a complex system, Seis. Res. Lett., 80, 551-553, 2009. Click here for html. Click here for pdf. Paper discussing the complex fault concept to intraplate earthquakes in China: Liu, M., S. Stein, and H. Wang, 2000 years of migrating earthquakes in North China: How earthquakes in mid-continents differ from those at plate boundaries, Lithosphere, 3, doi: 10.1130/L129, 2011. Click here for pdf. Paper discussing the long aftershock sequence concept: Stein, S. and M. Liu, Long aftershock sequences within continents and implications for earthquake hazard assessment, Nature, 462, 87-89, 2009. Click here for pdf. 2010 European Geosciences Union Stephan Mueller Medal lecture. Click here for pdf. 2009 Geological Society of America George Woollard Award lecture. 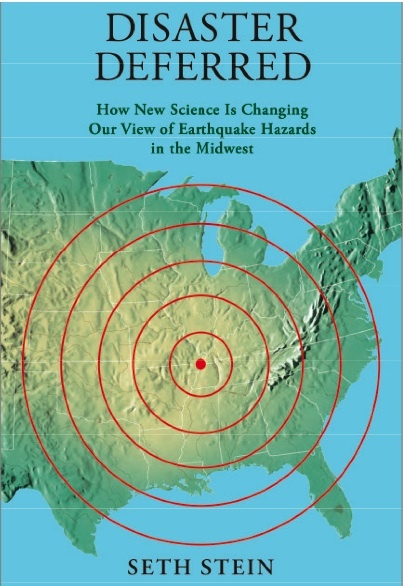 New view of New Madrid: little motion, complex faults, small hazard. Click here for pdf.